This is another alternative to Christmas pudding, sweet, suitably festive and lighter than the traditional plum pudding. It’s a variation on mince pies. You can make it with any mincemeat of your choice (for a home-made mincemeat recipe, see here). Grease two patty tins about 4 in (approximately 10 cm) diameter. Rub the butter into the flour and icing sugar. Beat in the egg yolk and press the mixture into a ball of dough. This quantity of pastry is much more than you need for the meringue tarts. About one-fifth to one-quarter of the pastry will be enough to make two meringue tarts. You can freeze the rest or store it in the fridge for two or three days to be used later. In theory, at this point you are supposed to chill the pastry overnight. I find it is less prone to break if I roll it out straight away. Roll out the pastry on a floured work surface. I like thin pastry so I roll mine to about 2 mm thick; you can leave yours thicker if you like. Cut circles big enough to make pastry cases lining the base and sides of your tartlet tins. Spoon mincemeat into the pastry cases. Don’t overfill them or the mincemeat will boil out and make an unpleasant mess on the baking tray. The filling should be no more than level with the rim. Whisk the egg white until it stands in soft peaks. Fold in the sugar using a metal spoon. 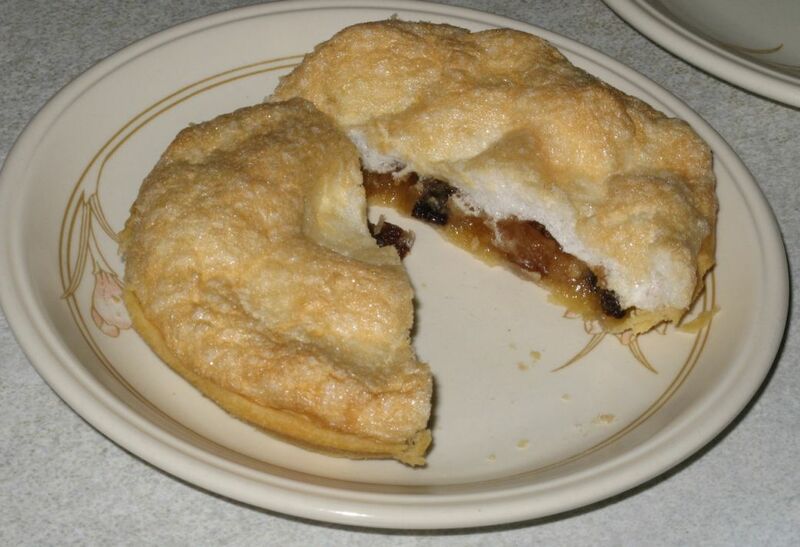 Pile the meringue on top of the mincemeat, making sure that the meringue seals against the pastry edges. Bake in a hot oven, around 200 C, for about 15 minutes until the meringue is set and golden brown. Let the meringue tarts cool for a minute or two in the tins to set the pastry, then lift them out with a palette knife or pie slice and serve immediately. Wherever you are, and whatever you are doing, have a happy Christmas, and best wishes for the New Year! Merry Christmas and a Happy New Year to you. Sounds delicious :) Merry Christmas and a Happy New Year to you, Carla, and thanks for another year of interesting and intriguing posts and reviews! Gabriele - Thank you very much, and I wish you the same. Annis - Thank you, and I wish you the same. Thanks for your comment - what a nice thing to say! E-book version in various formats (Kindle, EPUB (for Sony Reader), Palm )available from Smashwords. Signed copies available direct from author (limited stock), email for details. I'm a scientist with an interest in history, particularly the history of Britain in the 5th-10th centuries AD (i.e. between the departure of Rome and the Norman invasion). I write scientific journal articles, for which I get paid, and historical and fantasy fiction, for which I don't. I'm a keen hillwalker, though I live in the flatlands of East Anglia. I'm a devotee of BBC Radio 4, the network that justifies the license fee all by itself. Carla Nayland is a pen name.